Covers Newcastle Road Bridge, St Mary's Church, Railway Station, Field House, The Lawn and Drayton Bridge. Covers Railway Station, St Agatha's Church, Lower House, Bridge Inn, The Farm and White Rock. Double-sided map for extra coverage including St Mary's Iron Works, Islington, Broom Hill, St Mary's College, Railway Station, Upper Barr and Cemetery. Now part of Telford, covers part of Donnington Wood, Railway Station, Trinity Church, Stonyhill and St Matthew's Church. Now part of Telford. Incl Haybridge, Ketleybrook, Pottersbank. Includes parts of Wombridge, north Oakengates and St Georges. Now all part of Telford but here a varied industrial (and post-industrial) area, incl Trench canal. Post-industrial area littered with old coal workings. Now part of Telford. 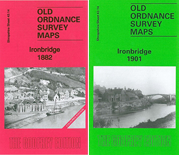 Covers Bridge & Roof Works, St Luke's Church, Deepfield Colliery, Coalmoor Colliery, Brandlee, Doseley and Railway Station. incl Cuckoo Oak and Halesfield Colliery. Now part of Telford area. Covers St Luke's Church, Holy Trinity Church, Madeley Union Workhouse, Albert Edward Bridge, Upper Froge and Styches Colliery. Includes area now covered by Blists Hill Museum. Now part of Telford. Double-sided to give good coverage of this small town. Covers Broseley Hall, Haycop Colliery, Broseley Tileries, Benthall Potteries, Broseley Wood, All Saints Church and Cemetery. Includes Railway Station, Gas Works, Stretton House, Brick Works and Brockhurst, On the reverse coverage extends northward to cover Church Stretton Union Workhouse. Double-sided to provide coverage of town, incl Oldbury, Castle Hill, High Town, St MAry Magdalene, Lower Town, Athletic Ground and Infirmary.